NITROGODS came about between ex members of Thunderhead and Primal Fear, with the addition of bassist/vocalist Oimel Larcher. Their new album “Rats And Rumours” is a pure and straight up Rock n Roll album with throaty vocals, rocking riffs and a thumping rhythm section. Opening up with title track “Rats And Rumours” I was very much reminded of Motorhead with some meaty fast guitar riffs and some very gritty sounding lead vocals. This is a great track to get heads nodding quick right at the beginning of the album, with a great catchy chorus. “Got Pride” follows this up with more of the band’s high energy rock sound, with a really great main riff and some pounding drums throughout. “Irish Honey” feels like a really heavy version of something The Clash might have done, with stabbing guitar riffs and winding basslines. This is a hard rocking album throughout from bluesier material like “Ramblin’ Broke” which has a bit of a NAZARETH vibe to the vocals with heavier riffage backing it, to songs that border on surf rock like “Automobile.” It’s all pretty good stuff, and the band has quite a diverse sound, keeping their own sense of style but changing it up plenty enough between songs to keep it interesting throughout its 43 minute runtime. One of my highlights was “Back Home” which combines some great vocal delivery with some great rock guitar riffs. There’s also an awesome guitar and bass duel about midway through the song that sounded great and showcased the individual talents of the members well, followed up by some great riffs and solos too. “BMW” is also a pretty great track with lots of high octane riffs throughout. The album closes on “Whiskey Supernova” which has a great furious riff to kick things into motion for the last track. This one is great, with thunderous drums, some great bass playing, awesome riffs and roaring vocals. This finishes the album on a very energetic and fun note, with a solid chorus too, ending on an epic crescendo. The production is pretty solid, and everything can be heard fairly well as the album goes on. The vocals and guitars sound the best here, but the drum sound is very good as is the bass. 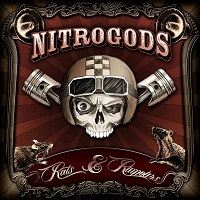 “Rats And Rumours” is a very good album from Nitrogods¸ with plenty on offer for those who like old school Rock n Roll produced in a more forward thinking way.